It’s Kathy’s fault. 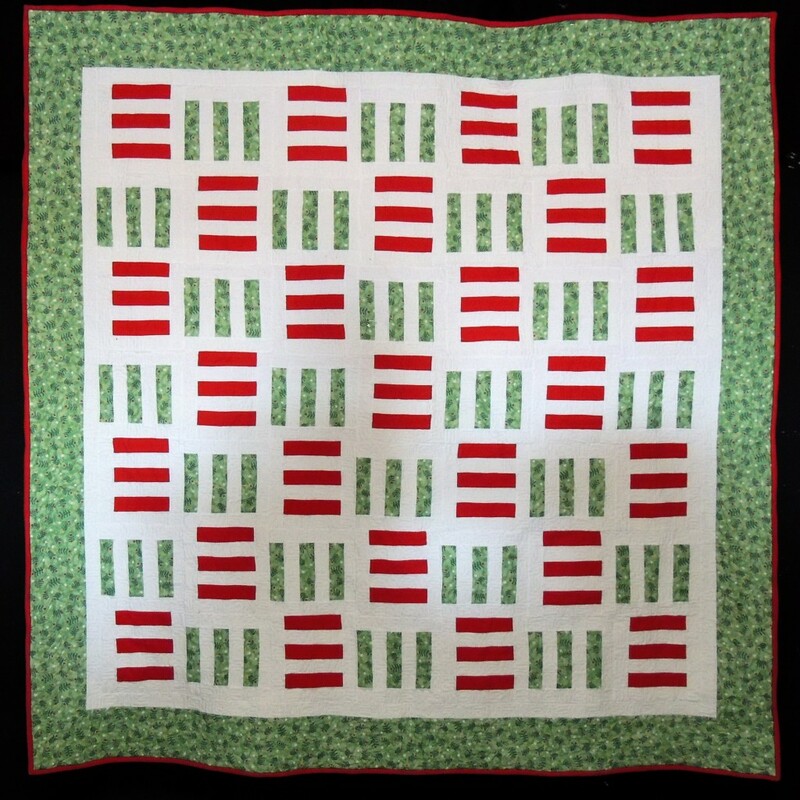 When I saw the great photo of her Flying Geese quilt in the snow, I wondered if I could do something similar, given I have no quilt holders nor line on which to hang it. I decided my neighbor’s adobe wall might be interesting. Although the winds have died down considerably, they still managed to blow the heavy flannel quilt around a bit. Here’s how the whole thing looks, hanging in the studio. It’s made from 49 of the Stripes block, with 2″ strips (to finish at 1 1/2 inches) sewn on the long sides to make 9 inch (finished size) square. There’s a 1.5 inch inner white inner border and the print border is 6 inches … making the whole quilt 75 inches square. If you follow my Sophie Junction blog, you know that both my cats have involved themselves in this project. 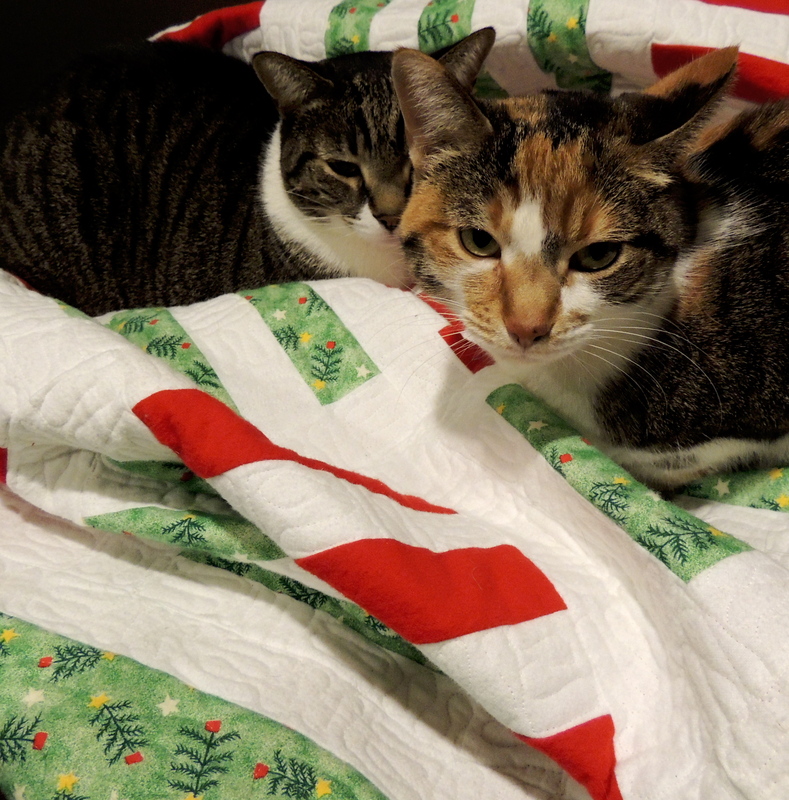 Last night, as I was quilting the border, the temperature outside dropped into the single digits and both Grace Hopper and Johnny Be Good decided they needed to be on the cozy flannel quilt, at the same time. They were very irritated with me as I kept moving in around the table, as I worked my way around the border. They’ll be so much happier tonight when they can curl up in the finished quilt. I can’t believe how quickly you finished that. It’s amazing. And now it will keep you warm! Love the quilt-on-wall look. Completed so soon is even better. A lovely festive quilt for two curious kitties to cuddle up in Sophie…It really looks terrific!